Omar Khayyám (1048-1131) - Some of the greatest Muslim apologists were Persians. Al-Fārābī was probably Persian, Avicenna was a Persian, and so was Omar Khayyám. Omar Khayyám was born about a decade after the death of Avicenna, and would become a great admirer of his. But he was not born in the Samanid Empire as was Avicenna. The Samanid Dynasty fell around the year 1000, when Avicenna was a young man. By the time Omar Khayyám was born, the region had become part of Seljuq Kingdom. And its capital was Nishapur which is where Omar Khayyám was born. Nishapur dates back to the Sāssānid era. It was founded by Shapur I (see Shapur I) as satrap capital. 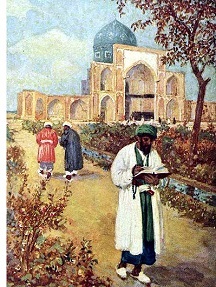 Tughril, the first Seljuq ruler, moved the capital from Bukhara, where Avicenna studied, to Nishapur. Though Omar Khayyám studied philosophy, he is most famous for his poetry and work in mathematics. He is well-known throughout the Muslim world, but remained relatively obscure in the West until the 19th century, when British poet Edward Fitzgerald translated his poetry into English in a volume called Rubáiyát of Omar Khayyám. After that, his popularity soared in the West as his writing talent was introduced to an entirely new audience. In mathematics, he wrote a treatise on algebra which is considered the most important of the Middle Ages. Omar Khayyám also gets credit for devising the formula for solving cubic equations. Besides poetry, philosophy and mathematics, he was also an avid astronomer, and in this field he also made an important contribution. In 1073, he and his colleagues built an observatory, and based on his calculations, developed a calendar which is considered more accurate than the Gregorian Calendar (see Gregorian Calendar) used throughout much of the world. This calendar is still in use in Iran today.